I bet you’ve seen pictures of an amazing, turquoise looking lake surrounded by mountains in Alberta. If it’s not Moraine Lake in the photos, it’s most likely Lake Louise – they’re both beautiful and only 20 minutes away from each other. However, if you visit Lake Louise in winter, the mountains will of course still be there, but the lake will be frozen. That means no amazing views and photos of the colourful water. On top of that, Moraine Lake, which is usually something you’ll want to include when you’re visiting Lake Louise, is pretty much impossible to reach at this time of the year. The road closes for the winter and there’s really no way to get there other than walking – which has its risks, such as crossing avalanche paths. But don’t let these facts keep you away from a visit to Lake Louise in winter – it has so much more to offer! This is why you should visit Lake Louise in winter – it’s a snowy wonderland! – Try to get to Lake Louise as early as you can, since it can be quite hard finding a parking spot. We were lucky and found one directly, but we saw others that had to queue to get one – that’s not how you want to spend the day! – Put on warm clothes – even if it doesn’t look that cold, it can be quite windy. You don’t want to freeze during this scenic visit, so bundle up! – Have winter tires on your car. The roads can be quite bad, depending on which road you take. Our general experience is that the Trans Canada Highway is rather well maintained, while some other roads in the area are not. Of course, it will also depend on the weather of the day. However, don’t take any risks – have winter tires on! Another risk factor is driving at dusk or dawn. We did it twice, and both times we had to stop for animals. Last time, we had a cougar crossing the road right in front of our car! The ice sculptures in Lake Louise are absolutely amazing! 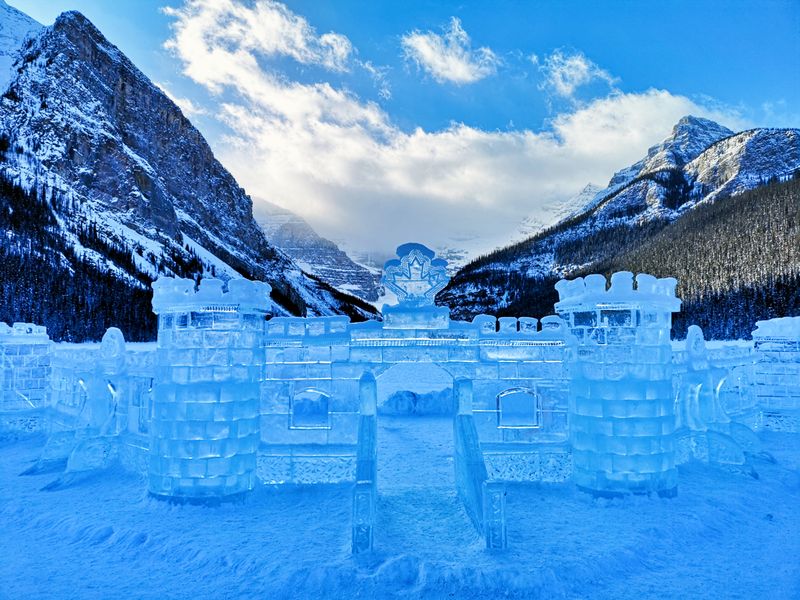 This amazing event takes place every year and is one great reason to visit Lake Louise in winter! 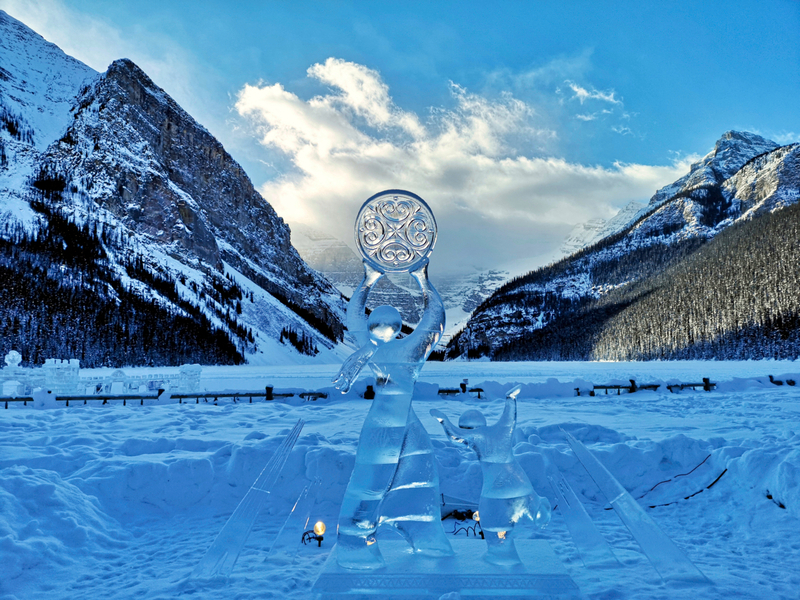 There’s an ice sculpture competition with some real masterpieces, and when the artists are done the sculptures stay at Lake Louise to be admired of all the visitors. The Ice Magic Festival typically takes place during a couple of weeks in January each year, but the rumour says the sculptures stay there until they melt – which means that you can probably arrive later to see them as well! If you’re visiting Lake Louise during the Ice Magic Festival, try to go there on a weekday. Not only will it be easier to find parking and less busy, but you can also inspect the sculptures for free – during peak hours on weekends, you’ll need to buy a ticket. 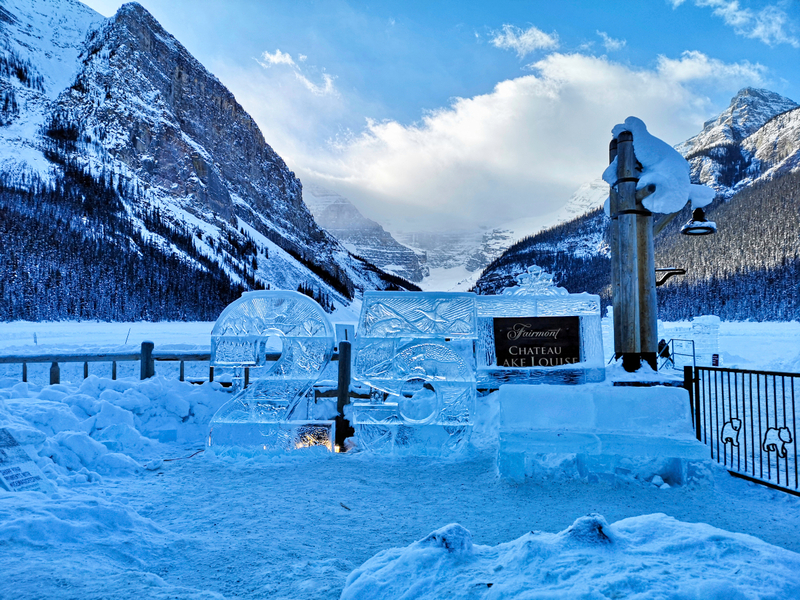 This year, 2019, the Ice Magic Festival in Lake Louise celebrated 25 years. Can you imagine skating on the lake, with the mountains surrounding you and with a campfire where you can get warm after you’re done skating? There’s even an ice castle on the lake! 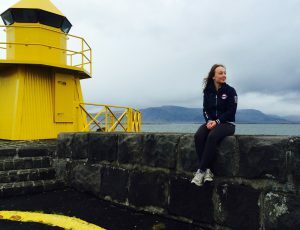 This is such an unique opportunity and an amazing experience! You don’t need to bring anything, since you can rent both skates and hockey sticks (if you want to have a real Canadian experience) at the Fairmont Hotel right next to the lake. Check out the rates here. You can even come here to skate under the stars at night! Look at this ice castle, such an amazing piece of art! This happens to be my area of expertise. When it’s cold outside, what better than snuggling up inside with a large cup of hot chocolate with some marshmallow and whipped cream? You can get this sugar bomb at the Fairmont Hotel, which has an amazing view over the lake. If hot chocolate isn’t your thing for some peculiar reason, they’re also well-known for their afternoon tea. Or, if you have a better budget than we do as backpackers, why not have lunch or dinner? It’s not too tricky to get to Lake Louise – it’s on the Trans Canada Highway. If you’re coming from Banff, you just have to follow the highway for another 45 minutes before getting on the Lake Louise Drive. If you’re coming from the west, Golden, the same applies. However, if you’re coming from the North, Jasper, Highway 93 which is known as the beautiful scenic Icefields Parkway, is the road you’ll have to take. Are you going to Lake Louise in a non-winter month and want to escape the crowds? Consider doing the Plain of Six Glaciers Hike! Liked this post? Save the pin! Get monthly tips & tricks here! Do you want more ideas for your future trips - such as destinations, hidden gems and other tips & tricks? Sign up for the monthly newsletter! ooh this sounds like a perfect winter wonderland! Maybe I should practice my ice skating before I go though, because my skills struggle on an ice skating rink with walls I can hold onto LOL. Gorgeous! We came in September, so there was snow on the mountains, but it didn’t look half as amazing as this! Wowza it looks amazing. I guess it wouldn’t be safe to do many of the trails in snowshoes, with the avalanche risk!? Oh did you have turquoise water in the lake in September? I’ll be there again in May/June, hopefully the ice will be gone by then haha! Yeah I think one should be careful and really check to be sure before going on the trails in winter. But I’m sure some at a lower level still are doable! Wow, that’s amazing! I don’t know how I would react if I saw a bear haha. We’ve only seen elks and a cougar so far, from the car! Oh good haha! Yes, please drop the link, I’d love to see them! Ok I’m literally dying to go here, your photos are incredible! Thank you this was so helpful! Oh I’m glad you liked it! Yes, it’s soo beautiful there! Can’t wait to go back in summer too, to see it in another way! Those ice sculptures look amazing! I have been to Lake Louise once but in summer and it impressed me so much! There is so much beauty and majesty in one place that I can’t wait to return, and would happily do it in winter. Yes, it was truly beautiful and the sculptures are so fantastic! I can’t wait to go back in summer though, it must be a whole other amazing experience! I laughed at your comment of “even if it doesn’t look cold…” – because this definitely looks cold! That said, my kids would go nuts over all the ice sculptures. The ice castle alone would blow their minds! Haha it does, doesn’t it? And I can ensure you that it was, but it’ still such a beautiful place so I didn’t think too much about it! Oh I can imagine, I found it truly amazing myself! oh so beautiful! Will visit here one day! 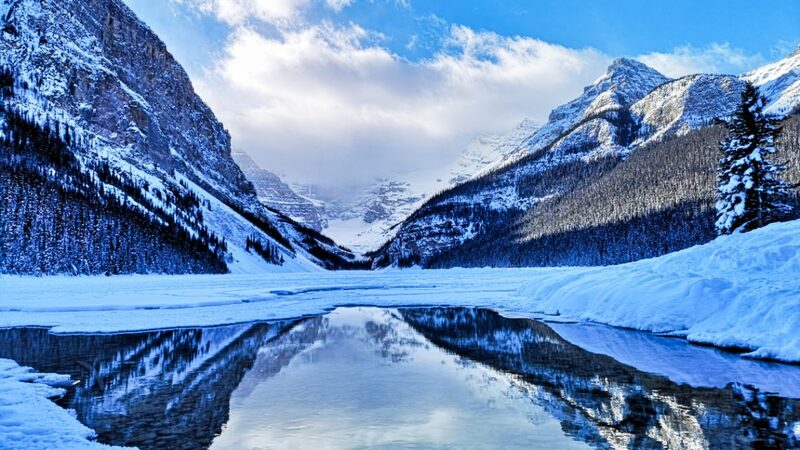 I’ve seen so many pictures of Lake Louise in the summer, because let’s be honest it’s stunning then too, but I’ve never seen it in the winter. It’s really so beautiful all year I guess. I would totally time it with the Ice Magic Festival too. Yes, same here! I haven’t seen any picture of winter in Lake Louise either but we figured we we’re so close, so why not pay it a visit – and we’re so happy we did! I have only been here in the summer, but I sure would love to visit in winter. 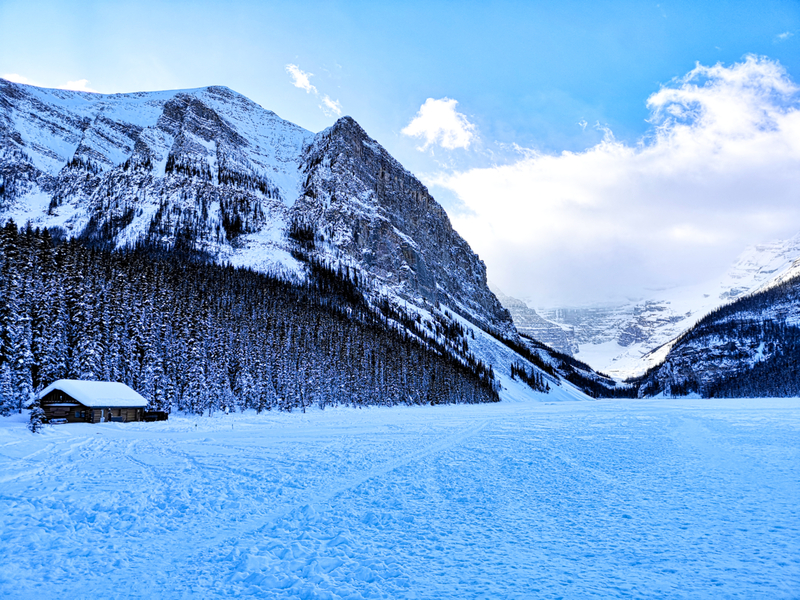 Lake Louise is certainly picteresque no matter the time of year. Yes, we plan to go back during summer, but we’re so glad we came here during winter too! The Rockies hold a special place in my heart as I used to live in Alberta. I’ve seen lake Lousie in all seasons except winter and it’s been on my bucket list to go back. The ice sculpture festival looks incredible. There are some seriously talented people out there. Oh I can imagine! Alberta is amazing, we’re so lucky to spend a year here. We’re definitely going back to Lake Louise during summer, but it was really cool to visit it during winter as well! Yeah, it’s amazing! So talented people. I hope you go, it’s such a beautiful place!